OK, so I think most people know I am frugal. But even I have had to think twice about this latest challenge that I have just signed up for: eating for less than $2 a day for a whole five days. And I would really love your support to motivate me to achieve this goal. This is not something random or freakish. I am not trying to starve myself. Instead, I am participating in the Live Below the Line fundraiser in support of Oaktree’s overseas initiatives. 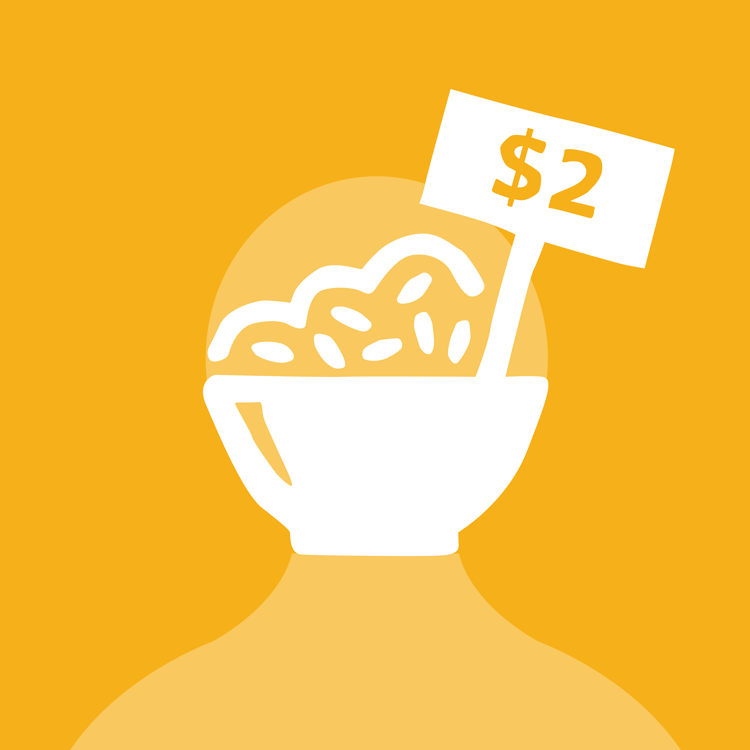 Specifically, it supports programs for young people in Cambodia, Timor-Leste and Papua New Guinea – basically places where many people exist on less than $2 a day. So the basic rule is that you can only spend $10 for five days (my first day starts tomorrow, 4 May). You can’t utilize free food – doh, this hurt as I have been gifted some wonderful things including home-grown persimmons. I unfortunately won’t be eating them this week. Nor will I be consoling myself with chocolates or starting the day with a cup of tea. 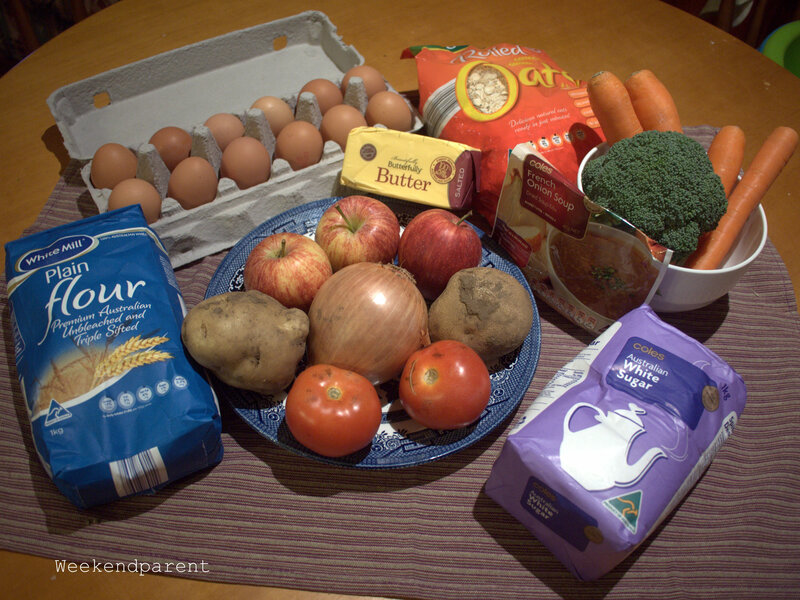 Most dry ingredients were from ALDI, with the exception of the French onion soup and sugar (Coles). I had a wonderful time at the Trash n Treasure Markets at Jamison Centre (Canberra) selecting apples and vegetables. 2A were most bored so I chose quickly; after I bought the apples and onions I noticed cheaper elsewhere. No matter, it was still good value and I could buy in small quantities. Some items such as butter and sugar are a bit of a luxury. I wish my food budget could have stretched to milk, because then I could have made yoghurt and splashed some on my morning porridge. I couldn’t do without sugar. Sad, but although I know it is not healthy I couldn’t face morning porridge without a bit of sweetness. I have some ideas for what to cook with this. But tell me, what do you think I could make and bake with these ingredients? And is it enough for five days? Are you feeding only yourself, Serina, or the children too? lizzygoodthings, I am only feeding myself on this challenge. I possibly could have included them as they often tend to eat only simple things like white rice and chicken soup anyway, but I think they are too young (5 and 2) to be subjected to such a drastic budget challenge. Maybe when they are a bit older we can do it together. Great Post. Great way to understand the value of a dollar and realize what is spent daily on fast food alone. It is so easy to spend lots of money on food. And to waste a lot:) I must admit that I was very good on this challenge, but I went back to my slacker ways the week afterwards. I hated throwing out food, and will be menu planning more to prevent it.